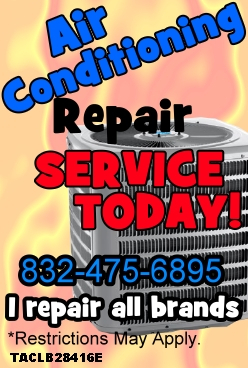 Austin Air Companie is a small HVAC service company owned and operated by Ray Austin. Austin Air Companie serves the greater Katy, Texas area and some surrounding areas. My primary company focus is the residential HVAC repair market. I also design and install new HVAC systems. I am licensed to work on HVAC systems up to 25 Tons in capacity. However, I specialize in residential HVAC systems so commercial work is not my primary focus at this time (2017). If the commercial HVAC system is set up with easy access I may consider it, call for clarification. Austin Air Companie is a small local family run business devoted to a high ethical standard and honesty and treating people fairly. I started in this industry in 1994 and obtained an AOS degree in HVAC/R Mechanic in April of 1996. I have been serving the Katy, Texas area since August of 1999. I am a Texas Licensed HVAC Contractor that repairs, replaces, designs and installs HVAC systems. With my HVAC company you have the ability to deal with one person. Many of my customers are on a first name basis with me. You’re not treated like a number here. SERVICE is what the HVAC business is all about. *Note: NATE certifications are dual meaning certifications in repair as well as installations. Austin Air Companie provides heating, air conditioning, and HVAC zoning services in Katy, TX and the surrounding areas. Austin Air Companie is a HVAC contractor owned company. Owned 100% by Ray Austin (no investors). I am under "no pressure" or "any obligation" to recommend, repair, service or install any particular brand or solution to the customers who choose to use my HVAC Services. I am a "one man operation". A Texas HVAC licensed contractor serving the entire west side of a major city that likely has over 4 million people. My opinion is only given in person in a ’in home visit’ to your home. I follow all licensing rules and regulations and building codes. Service is normally scheduled as ’on demand’ service. Calls are run in the order they are received. In most cases and depending on service demand most calls are completed within a few hours of receiving the call. The graphic HVAC animation below is an elaborate example of my work. Many of the air conditioning jobs I take on are not quite this large and some of the HVAC installation jobs I have done are impossible to put in a format that most people will understand. I tackle AC installation jobs with various requirements from dream home rennovations, redesigns of HVAC systems to reduce or eliminate tenant complaints, repairs to pass HVAC home inspection or home sale issues regarding building code violations and so on. There typically are no two air conditioning repair jobs that are exactly alike. The opinions and or options I provide you with to correct and address your HVAC system(s) are based on 23 years of hands on experience (as of 2018) and are typically what I feel are your best options to correct and or fix / repair your HVAC system at the time in which it fails. The HVAC industry and as it relates to the residential real estate market is a dynamic market that is continually changing. What I may offer as an option or solution one month may change to something else a few months later. Realize, your options are put together at the time you booked your service and possibly before some other option or solution was known. Thank you for your business. I sincerely appreciate it.